I've mentioned before that we just made it through a couple of weeks where we were basically house bound. Between illness and the heat outside, we didn't have much choice but to hang out indoors. With two toddlers, that gets old fast. 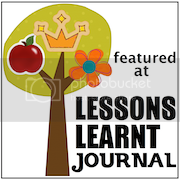 I scrambled to find some activities that were easy to do (I was sick after all) and that would keep the kids' attention for a fair amount of time. 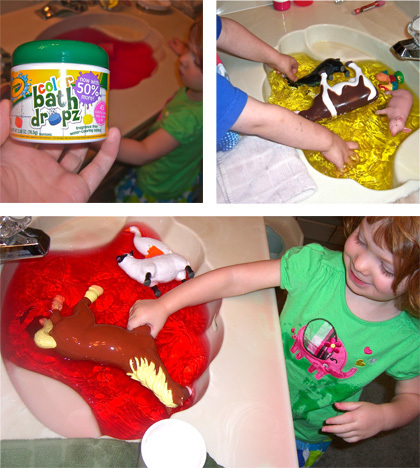 One activity that turned out to be a favorite was the Animal Color Bath. I found the Color Bath Dropz at the grocery store. You can add one or more color tablets to change the color of the water. We experimented with the tablets and found that it was a fun learning experience. It's really fun to see how the water can change from red to orange by the addition of a yellow tablet or yellow to green by adding a blue tablet, etc. The kids loved playing in the water. They also loved washing their farm animals. 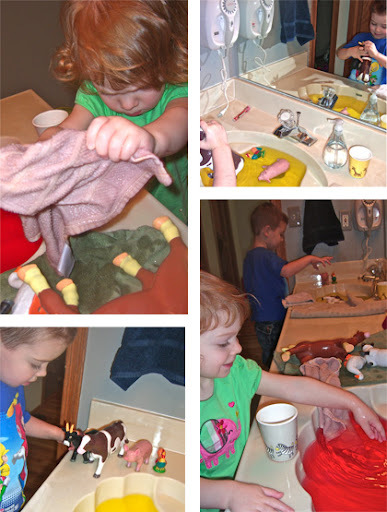 I gave them each a wash cloth and a towel to dry the animals on. It's absolutely amazing how something so simple can be so engaging. They spent a good 45 minutes washing their animals and playing in the water. 45 minutes of peace, ahhh. This looks like so much fun! I will have to get some of those color tablets. I think that my little one would have a blast with it. I love the love the idea of washing their animals...and that it kept them busy for so long. 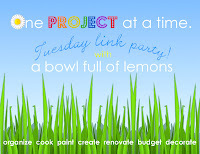 ;-) Thank you for sharing at Teaching Time and I hope that you come back and link up something again this week! Oh, how fun!! Water always seems to entertain them doesn't it? Thank you for sharing at Sharing Saturday! !